To lead is not to influence others to do something they are not committed to, but rather to nurture a culture that motivates and even excites individuals to do what is required for the benefit of all. More than half of the world today recognises true leadership potential among the youth. Yet in Bangladesh, a country where one third of the total population is young people (age 10-24), the notion of youth leadership has been long disregarded. Perhaps the political system is the only stand where youth leadership has been acknowledged though not decisively. Today youth leadership is changing the mindset of society and is becoming a new dogma in the cultivation of environment that brings out the best. Hence many are realising that our future lies in the hands of the youth and their successful leadership to restore social, economic and political developments. In line with this notion, Independent University, Bangladesh (IUB) took the initiative to organise a two-day interactive training workshop entitled 'Leadership Development: Youth Empowerment and Activism'. The International Affairs Club (IAC) of IUB, a student based organisation which provides an understanding of global citizenry and instil in the values of peace, justice, understanding and participation, organised this programme on July 17 to 18 in the premises of IUB. The workshop was inaugurated by Ambassador Jamil Majid. About 56 young participants, mostly students and young employees, from 17 different educational institutions including IUB, BUET, NSU, BRACU, Comilla University, BIT, Scholastica, Sunbeams, International Turkish Hope, Mastermind and concerned organisations like The Asia Foundation, Grameen Phone, City Cell, AKTEL participated in this training workshop. Moreover, participants from universities outside of Bangladesh, Adelphi University (USA), Bart College (USA) and University College London also took part in the workshop. The aim of the programme was to improve youth leadership skills and knowledge through their active citizenry and entrepreneurship. Distinguished persons from UNDP and international organisations, eminent professors, and former ambassadors moderated the workshop. The enthralling workshop was divided into seven sessions, including one field visit to a youth led project and a problem solving session held by Farha Khan, President of IAC. Barrister Harun ur Rashid, Former Ambassador to UN, Geneva, K. A. M. Morshed, Assistant Country Director and Head of the Programme, MDGs and Pro Poor Development, United Nations Development Programme, Ejaj Ahmad, CEO, Bangladesh Youth Leadership Center (BYLC), Farid Uddin Ahmed, Executive Director, Arannyak Foundation, Syed Munir Khasru, Professor, Institute of Business Administration, University of Dhaka were among the spokespersons who conducted the programme. During the first session, 'International Relations and Development (IRD)', Barrister Harun ur Rashid explained about the current scenario of international relations, major international policies, position of UN, SAARC and many other intergovernmental organisations, Bangladesh Government's foreign policies, and youth's participation for international development. The main objectives of this session were to inform youth about the major IRD policies, Bangladesh and UN's position and understanding of responsibilities and opportunities for youth in Bangladesh and abroad. K. A. M. Morshed spoke on 'Youth and Millennium Development Goals (MDGs)'. He focused on the MDGs condition in Bangladesh and some other regions, and youth's involvement and opportunities to successfully achieve those in a developing country like Bangladesh. 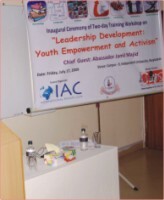 'Leadership for the 21st Century' was the third session of the programme, which was conducted by Ejaj Ahmad. He discussed on types of leadership, major skills that one must master to become a perfect leader, community leadership, comprehension of responsibilities and opportunities of 21st century. He gave the example of BYLC students, who came from various backgrounds like Madrassah, English and Bengali Medium Schools, and doing a fantastic job by practicing community leadership in Mirpur and Uttara's slum areas. He also explained the short term and long term opportunity cost benefit analysis which is very important to fix one's vision and objective. "The first day of the workshop was indeed an eye opener and gave me a critical sight of leadership," expressed Kazi Sarmad Karim, tutor in BRAC University. "I liked Ejaj Ahmad's definition of a leader. He said a leader is who leads on to make changes for the betterment but he is not a hero. This workshop is going to assist me in my profession," he added. The fourth session was about 'Nuts and Bolts of NGO Management, Development, and Administration' and was conducted by Farid Uddin Ahmed who gave out a brief overview to the young participants on 'Social and Business Entrepreneurship', and the basic idea of organisational management, development and administration in the context of Bangladesh. The objectives of this session were to understand the basic functions and mechanisms of NGOs and to encourage the youth to develop their social and business entrepreneurship. After finishing this session, the participants were taken to a field visit to Jaago Foundation, an organisation that aims to empower the unprivileged children with the skills that will allow them to protect themselves from discrimination and injustice. The participants met the children who live in the slum, yet study the same syllabus as of many English medium school students. The amazing part was how they showed their interest in learning English and browsing Internet using the computer lab. "We were quite moved from the initiatives of Jaago Foundation. The children were given extensive lessons in English. Not only were they able to speak in English, but were actively participating in play, artworks, and other extracurricular activities," said Nandita Khan and Navin Khan, two sisters who took part in the workshop. Syed Munir Khasru spoke on the last session on 'Personal Development'. During his session, he shared his personal experiences of the real life difficulties, and focused on the major skills for personal development through struggling in this competitive world. Rather than wasting time, he suggested students to ask their seniors about the academic areas they wanted to get in and encouraged the participants to explore their hidden potentials in building human capital. As the workshop concluded with certificate giving ceremony by Farooq Sobhan, President of Bangladesh Enterprise Institute (former foreign secretary and ambassador), Professor Omar Rahman, Pro-Vice Chancellor of IUB left a riveting note for the young participants. "The notion of a taxi driver's son would also become a taxi driver is changing these days. One has to think out of the paradigm. It is evident that students who go abroad to study hardly ever come back to Bangladesh. This is how we are losing the brightest minds. Perhaps the lack of opportunities in Bangladesh is failing to attract them. Nevertheless, we need to restore today's youth and make them believe that this country needs unique leadership ideas for the enrichment of the nation," he said. Professor Bazlul Mobin Chowdhury, Vice Chancellor of IUB, and Dr. G M Shahidul Alam, Faculty Advisor of IAC (Head, Department of Media and Communication) were among the distinguished guests who also spoke on both the occasions, and encouraged the young participants to develop themselves and enhance their leadership qualities. The workshop gave a hands-on experience to the participants on leadership development and depicted their role as active citizens in today's world. As countries like United States, United Kingdom, Canada, Australia as well as developing countries like Singapore, Malaysia and India excel in initiating activities concerning youth, Bangladesh should not lag behind rather should craft a fine commentary of youth leadership through this kind of programmes. Iconic figures like Mark Zuckerberg, the 23-year-old Facebook founder whose innovative idea to invent a social network turned him into billionaire, might also lie among a Bangladeshi youth. All that is needed is to develop the upbringing of the youth to become proactive. Students themselves can take many initiatives. For instance, the quality of people who are entering in the government sector is considerably poor. Less then one percent of people are entering the government service with a foreign degree. What youth can contribute in the development of our society is beyond explanation as experts say and it is about time when the government should recognise the virtues of a true leader within the youth society and utilise it for the betterment of the country.